When Musco Light made its debut at Notre Dame Stadium in 1982 for the first night game ever at that historic venue, it demonstrated our vision and innovative spirit. 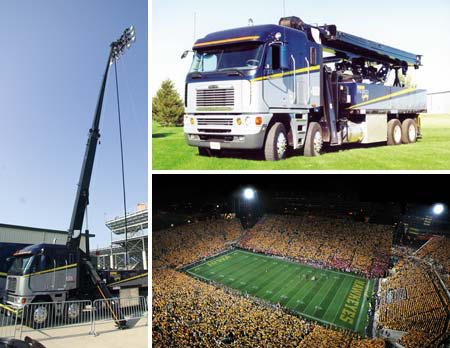 Now more than 30 years later, Musco Light continues to lead the way in mobile sports lighting technology, offering the most powerful, cost effective, and trusted solution in the world. The system provides an array of 15 remote controlled 6K HMI lights mounted on a 150-foot hydraulic boom, resulting in 120 million candela of light on wheels capable of lighting up to 40,000 square feet with 25 footcandles as far away as half a mile. Musco Light is completely self-contained. It features a streamlined design, and with an experienced Musco technician at the controls the system delivers convenience, minimized set-up time, and reduced labor costs. From small baseball fields, to major college football stadiums, to some of the biggest feature films around the world, Musco Light has provided a level of quality that’s resulted in enhanced broadcasts and award-winning productions.